Bigasoft MP4 Converter is an awesome and appropriate video conversion software . It will help you watch your favorite videos on a MP4 playback device . You can convert your videos for watching on various MP4 playback devices and it supports a wide range of multimedia devices such as iPod, iPhone, Archos AV500, Archos AV700, Archos Gmini402, iRiver PMP-100, Creative Zen, Vision, Zune etc. Bigasoft MP4 Converter has an easy to use and user friendly interface and with the help of its easy to use interface you can convert almost all video formats like AVI, MPEG, WMV, MOV, RM, MP4, MKV, MOD, 3GP, VOB and H.264/MPEG-4 AVC video to MP4(MPEG-4) and the best thing is that without losing original quality . As well as you can extract audio from videos and save them in various audio formats like MP3, WMA, M4A, AAC, APE, MIDI, and WAV etc. Batch conversion is also available to convert multiple videos at once . It has NVIDIA CUDA computing technology which helps Bigasoft MP4 Converter to accelerate the conversion to revolutionary fast. Bigasoft MP4 Converter works perfectly with all Microsoft Windows versions . It works with Windows 8, Windows 7, Windows XP, Windows Vista, and even with Windows 2000 . It supports multi-language including English, German, French, Spanish, Japanese, Arabic, and the good news for Chinese readers now Chinese language has been added . And now a bit about its system requirements . It does not require extraordinary system resources at all . You need normal processor speed , 1GHz processor and 512 MB RAM speed and 300 MB free disk space is needed to install it . You can read its full list of features at the Homepage . 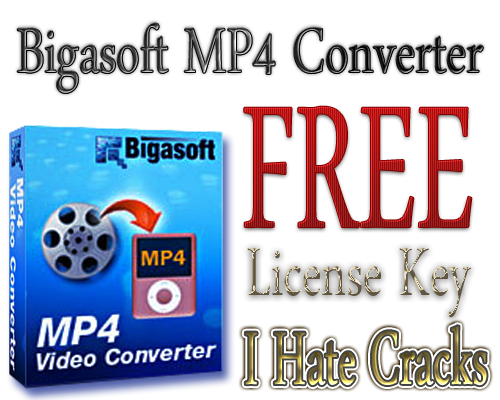 Bigasoft MP4 Converter is available priced at $29 per li1cense key but there is a giveaway offer is going which through every interested reader can grab it with legal license key for free. The name will be shown up in the about dialog of your application ” And hit ” Enter ” button . You will be sent a free license key with a download link to your mailbox .